The Russian government has forced the chief executive of the state-owned United Shipbuilding Corporation (USC) to resign. Andrei Dyachkov, who was appointed to run the shipyard holding in June of last year, signed a letter of resignation on April 30, and then took sick leave. He is reportedly in hospital for Soviet reasons – he needs to be isolated not from germs, but from his rivals. The affair has been leaking into the press slowly for weeks, and was accelerated last month when Dmitry Rogozin, the deputy prime minister in charge of the military industrial complex, gave Dyachkov a public dressing-down. But the real power behind the shove into Dyachkov’s back, according to sources close to the shipyards, is Igor Sechin, currently chief executive of Rosneft and formerly chairman of the USC board. Dyachkov is not the first to be ousted by Sechin. Roman Trotsenko was ousted in June 2012. Before him, Sechin got rid of Alexander Buzakov in November 2009, and others before that. Their tale was told here. Indeed, the only continuity in supervision of Russian shipbuilding since 2008, according to an official close to Sechin, has been Sechin himself. “Pay attention,” Rogozin told Dyachkov on April 13, “and tear off heads of those who send me” misleading information. Rogozin, an influential politician who served in the State Duma until he was appointed as Russia’s chief representative to NATO between 2008 and December 2011, is a novice in the shipping industry. 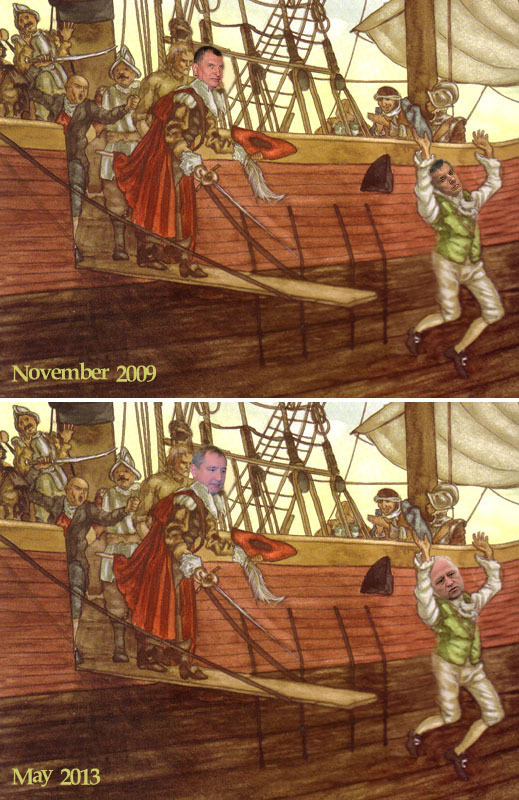 In the wake of his attack on Dyachkov, there was no official response from USC. But a USC source claimed the company was unsurprised by the high-level criticism. It had heard it all before during Trotsenko’s time. It seemed, the source implied, that there would be no repercussions from Rogozin’s attack. One of the targets of Rogozin’s attack was the rebuilding of the Zvezda shipyard at Bolshoi Kamen, across Ussuri Bay from Vladivostok. The complex had been a naval submarine yard until the government in Moscow decided on conversion to civilian use, and expansion of non-military construction to supply the requirements of the oil and gas boom in the Russian sector of the Sea of Japan and Sea of Okhotsk. USC then acquired the majority of the port company shares, and negotiated a joint venture with Daewoo Shipbuilding and Marine Engineering (DSME) for a $200 million investment to build tankers, LNG carriers, and drilling platforms with displacement of up to 350,000 tonnes. 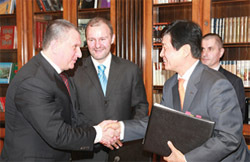 This has been one of Sechin’s priorities since the Russian and South Korean governments agreed in 2009 to participate in the project. On June 3, 2010, Sechin presided at the signing of a joint venture between USC and DSME at the Zvezvda complex. The latter issued a release explaining that “with this contract, DSME will construct state-of-the-art shipyard facilities such as a dry dock and a Goliath crane. The yard will be extended by 1 million square meters to take up 1.6 million square meter of land in order to build Large commercial vessels and offshore plants. DSME expects to secure new orders from Russia through this agreement by agreeing to continue building vessels for the Zvezda shipyard.” In the photograph, Sechin is on the left, Trotsenko in the centre. Note that the Koreans expected that as part of the Zvezda deal their yards in Korea would also benefit from Russian vessel orders. That hasn’t happened yet. Neither has DSME begun their investment in Zvezda, USC has been going it alone. Rogozin is not commenting on the ouster of Dyachkov. His last message to followers of his Twitter site, dated May 5, is a greeting on the occasion of the Orthodox Easter holiday. Rogozin ends with the traditional Russian, “Christ is risen”. Dyachkov, a career shipbuilder and veteran of the Sevmash submarine yard in Severodvinsk, took over at USC from Roman Trotsenko, after he was ousted suddenly himself. Like Trotsenko, Dyachkov has been under pressure from the Russian Navy and Rosoboronexport, the military exporter, for trying to raise prices for naval vessel orders. Before the latest attacks on Dyachkov, Trotsenko was also criticized for the slowness in commissioning the new super shipyard at Kronstadt [St. Petersburg] and the Zvezda shipyard. For what Trotsenko did to deserve his promotion by Sechin to USC, his management success and failure, and the circumstances of his dismissal, read this. The source believes Trotsenko is also behind the ouster of Dyachkov because he is hoping to promote schemes for a new Rosneft fleet of gas carriers and large oil tankers, for which Zvezda is necessary. There was no response to requests for comment from Rosneft.